The now available book Raising Kids to Thrive: Balancing Love With Expectations and Protection With Trust is a great book for any stage of parenting. My kids are nine and fifteen and I found so much of the information in the book to be helpful and valuable. With having a teenage son I've found myself often wondering if I'm giving him enough...or even sometimes too much freedom. I want him to learn to do the right thing from what we show him and lead by example, but I also want him to learn how to do things on his own too. But of course as a parent I'm always going to be worried that if I give him too much freedom something may happen to him when he's out on his own. Luckily this book helps teach parents how to find a good balance between protecting and trusting our children. It also talks about expectations as parents and how to do what's best for our children without crossing the line. Yes we want them to do and have the best, but we also have to let them grow on their own too. Just because dad played football doesn't mean his son has to play football too. And sometimes forcing the subject can cause a rift between parent and child or cause them to rebel because you may force your preferences on them. We have to accept them for who they are during all stages of their lives no matter how hard that may be sometimes..especially when they make a bad choice and fail. And I have to admit as a parent sometimes it's hard to show them the unconditional love all the time instead of disciplining them when they make these mistakes. I could truly go on and on about all the things I learned while reading this book. Yes there were things I already knew in it, but there were also things that gave me that "Oh yeah, I never thought of that" moment too. So if you are a parent (or plan to become one) I would recommend this book to you for sure. A little bit from the book. • Balancing unconditional love with high expectations. • Eliminate the need for helicopter or “tiger” parenting. • Start meaningful conversations with their children by being a sounding board, not necessarily a dictator. • Become a stable beacon so their children can turn to them for guidance and self-measurement. • Understand and accept that people are uneven and the importance of expecting growth, not perfection from children. • Reduce anxiety – for themselves and their kids – as they venture out on their own and move into adulthood. • Holding our kids to high moral standards, while also being a role model for those standards. 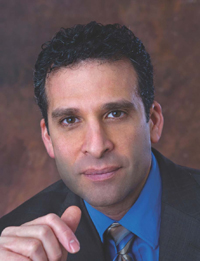 Kenneth R. Ginsburg, M.D., M.S. Ed, FAAP is a specialist in adolescent medicine at the Children’s Hospital of Philadelphia (CHOP) and a professor or pediatrics at the University of Pennsylvania School of Medicine. He is also director of health services at Covenant House Pennsylvania. He has over 100 publications, including 30 scientific articles and 5 books including the award-winning/best-selling Building Resilience in Children and Teens (American Academy of Pediatrics). He drafted the AAP policy statement on The Power of Play and has been an expert source for several prominent parenting news articles and reports in media outlets such as The Wall Street Journal, The New York Times, USA Today, TIME Magazine, ABC News, Yahoo! Parenting, NBC News and CNN. He is working with The Boys and Girls Clubs of America to incorporate resilience-building strategies into their programming. He is also honored to be working with military parents and professionals to incorporate stress reduction and resilience building strategies into the lives of our nearly 2 million military-affiliated children. His greatest privilege is to be a husband and the father of two teen-aged daughters. Buy it: You can purchase Raising Kids to Thrive: Balancing Love with Expectations and Protection with Trust on Amazon. Sounds like a great, helpful read. I'll have to tell my daughter about this so she can read about parenting my grandsons. 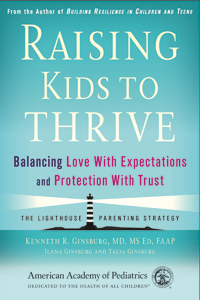 (Raising Kids to Thrive Book Review @healthychildren #raisingkidstothrive #drkenginsburg) Sure sounds like a great book for parents to read. It can be hard trying to point them in the right direction all the time, just always be there to listen to what they have to say.